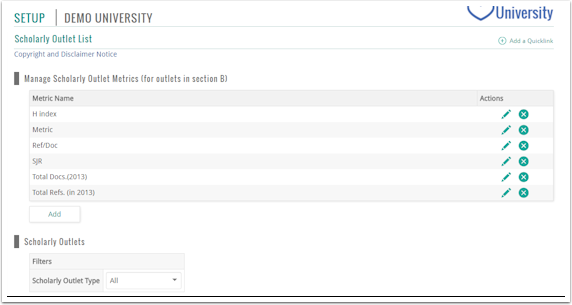 When adding a Scholarly Contribution and Creative Production entry to the Activity Input Form, related scholarly outlets can be set up to dynamically display when entering a scholarly outlet name. Metrics can also be viewed for individual scholarly outlets. Each institution is responsible for uploading their own scholarly outlet data. 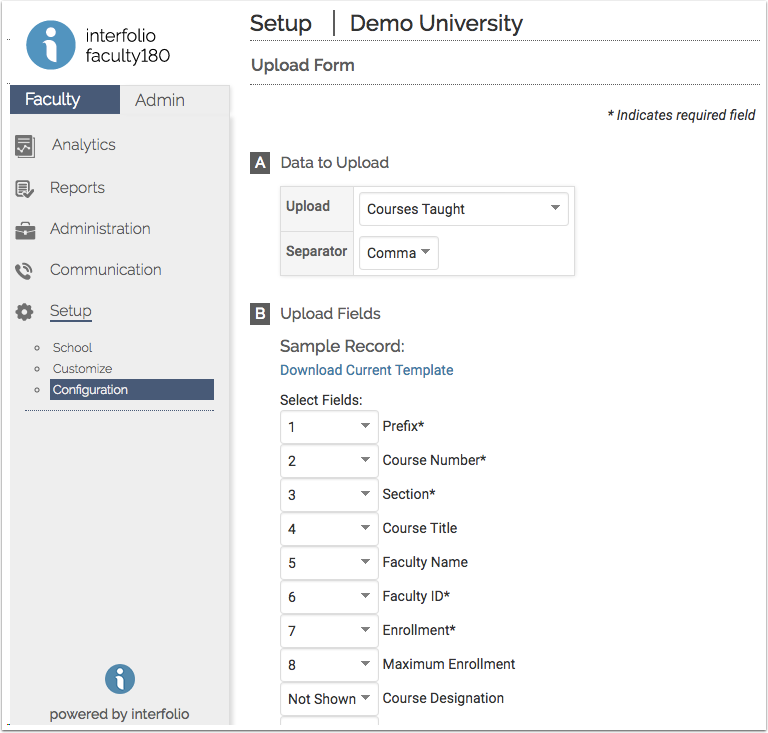 Interfolio is providing institutions with the following scholarly outlet files that can be uploaded into FACULTY180. This is a complimentary service, and therefore we do not guarantee the accuracy of the data in these files. In addition, we cannot guarantee that the data in these files will be maintained; therefore, institutions are responsible for the maintenance of their own scholarly outlet data. Submit a support ticket to have the Scholarly Outlet List feature activated for your institution. Uploading scholarly outlet lists and metrics to FACULTY180 is a two-part process. Note that scholarly outlet lists and metrics must be uploaded as separate files, and scholarly outlet lists must be uploaded prior to uploading scholarly outlet metrics. 1. 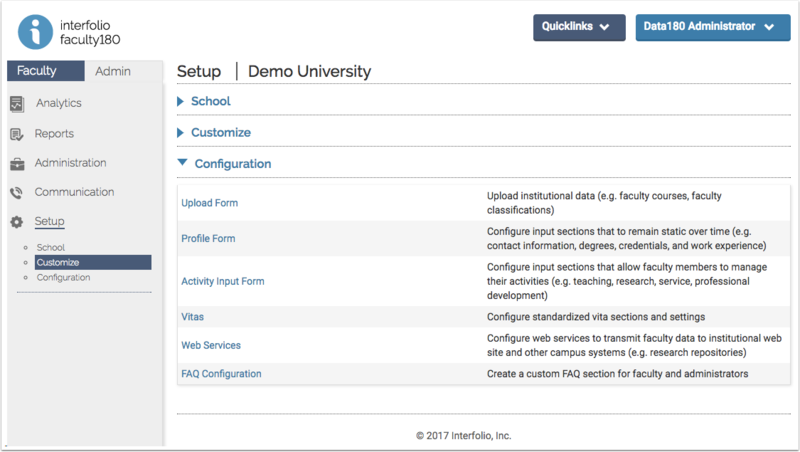 Configure the Field Names for the Scholarly Outlet Lists and Metrics in the Upload Form. In the Upload drop-down, click Scholarly Outlets or Scholarly Outlet Metrics, depending on the type of data being configured. In the Sample Record section, select the fields to be displayed in the Scholarly Contribution and Creative Production section. When you are finished, click Go Back. 2. Upload the files containing the scholarly outlet lists and metrics. 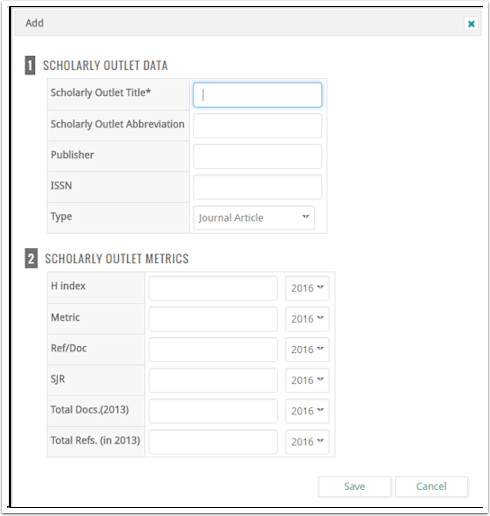 In the Type list, click Scholarly Outlets or Scholarly Outlet Metrics, depending on the type of data being uploaded (scholarly outlet lists must be uploaded prior to uploading scholarly outlet metrics). Complete the process for uploading the files. Click Scholarly Outlet List in the Customize section. The Scholarly Outlet List screen displays. Click the Edit icon adjacent to the desired scholarly outlet or scholarly outlet metric. Scholarly outlet lists and metrics can also be deleted from the Scholarly Outlet List screen by clicking the corresponding Delete icon. Click Add in the Manage Scholarly Outlet Metrics section. Type a name for the new metric in the Metric Name field. Select the appropriate Scholarly Outlet Types. Click Save. The new metric now displays in the Scholarly Outlets section. Click Add in the Scholarly Outlets section. Type the title of the new scholarly outlet. An abbreviation for the scholarly outlet, the scholarly outlet's publisher, the scholarly outlet's ISSN, and the type can also be specified. Click Save. The new scholarly outlet title now displays in the Scholarly Outlet section.